Since 1991, serving immigrant, refugee, visible minority, non-status women and children experiencing family violence in Metro Vancouver. We are a non-profit organization offering free and confidential services in twenty languages. 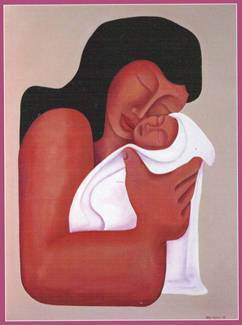 We provide culturally responsive services to immigrant and visible minority women and their families who are experiencing family violence. 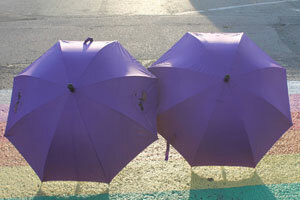 You can help us support our programs and services by purchasing our purple umbrellas. 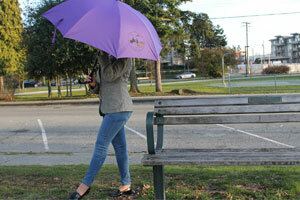 A purple umbrella signifies shelter against inclement weather. It is a temporary safe individualized protection used during a movement to a more permanent and stronger protection. It is a metaphor for the support that VLMFSS workers provide to women on their journey from a life of violence to a life of safety. Some supports withstand the length of time and some are brief. We hope these umbrellas will stand up to external pressures and provide protection for a long time. 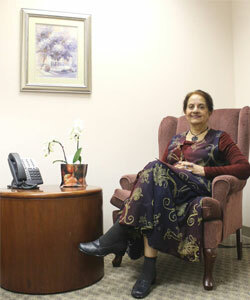 After 26 years at the helm of the Vancouver and Lower Mainland Multicultural Family Services Society (VLMFSS), Shashi Assanand has retired as the organization’s Executive Director. on whose traditional territories we empower immigrant and refugee families. "Let's Work Together To End Family Violence"